TheBlueGuerilla: Hewitt Hits 2013 Pink List. WIRRAL Tory Youth Chair' Tara Hewitt has sensationally come in at number 43 on this years The Independent on Sunday's Pink List. Tara's spot outranked Gok Wan, Jessie J, Alan Carr, Derren Brown, Will Young and Iain Dale. The Indy says - "Recently elected chair of Wirral Conservative Future and deputy chair of Conservative Future North West, the trans and human rights activist is being assessed as a potential parliamentary candidate." 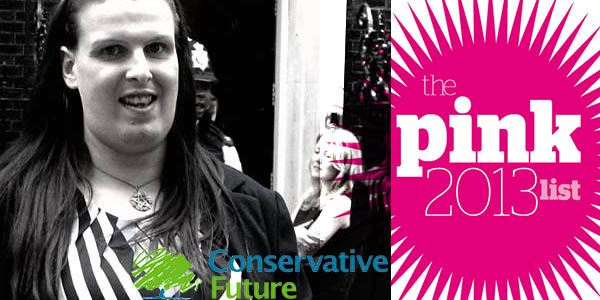 Tara exclusively told tbg - "I’m privileged to be included in the Pink List 2013 alongside some inspiring and very special people, it’s nice to have your work recognised and I hope my inclusion as a Trans and Bisexual Women will encourage other LGBT people to achieve their goals and highlight how as the Conservative Party, we are made up of people from all backgrounds who support the values of hard work and success." Sick of hearing about her. If the rumours are true and she stands for CF Chair, I'm out. Ridiculous. How on earth can she outrank Jessie J, Alan Carr, Gok Wan and Iain Dale? Shes an ignorant pain in the arse. Tara's inclusion in the Pink List 2013 is testament to the work she does on a daily basis to raise awareness of and stand up for the LGBT community. Her passion for the cause shines through so I'm delighted that she's now got the national recognition she deserves. The Conservative Party is fortunate to have such a strong and committed campaigner like Tara. She's full of ideas and an absolute pleasure to work with. Tara is an absolute liability for the Tories and if she thinks she has a future as a CF chair or heaven forbid a PPC she's sadly mistaken. The number of people who can't sand her as well as his always playing the 'trans card'. More concerned with own ego rather than being a true conservative. Hopefully jump ship back to labour as we can't allow drop standards just to appear 'inclusive'. If Tara ever becomes a PPC as suggested it will be the trans card and nothing else. Making a career out of it. Q:Jonathan Levy,so well thought of? why is she photoshopped from campaign photo "Campaigning in Wirral West with Esther McVey"
A: Known as a shameless self publicist. Jonathan you are either dim or gullible. If she's being considered as a PPC anywhere we are still in the dark days of preferential treatment and A-listing that landed us with other non-Conservatives like Louise Mensch. Unlike Louise she can hardly write - have you read her blog? "Blueblairite"? Well done her for getting herself on the Pinklist, she has worked tirelessly on self-promotion to do it. If she becomes a PPC there is something seriously wrong with party. She has only been a member for 5 minutes . And I don't think people are convinced by her opinions either. I'm Conservative, and I think it would be brilliant if Ms Hewitt became a parliamentary candidate. The Left likes to claim monopoly over feminism and LGBT rights, but having people like this in the party proves that isn't the case. If she becomes a PPC I'm jumping ship to UKIP.